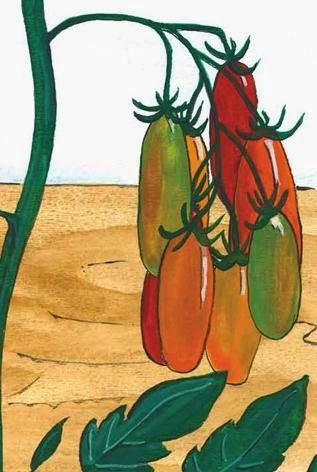 Intelligently thought out, Tino and the Pomodori (Tomatoes), a children's book, begins with six illustrations depicting how a tomato seed becomes a seedling, then a plant, then a flowering plant, then the plant growing the tomatoes, and lastly, a crate of harvested tomatoes. The child gets an overview of what he is about to learn, showing that the author and illustrator are experienced educators! The sun woke Tino early this beautiful morning in his small Italian village. The first line of the book introduces Tino, a young boy who lives in Italy. I like that Italy's most famous produce is linked in a child's mind to the country. 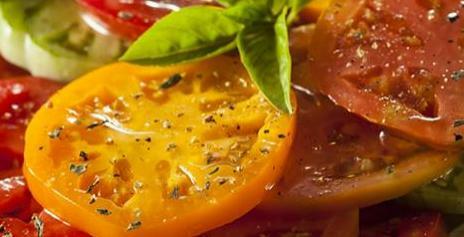 Tomatoes come originally from Latin America, but no other country has made tomatoes their national produce the way Italy has, using it to make the famous pasta sauce and so much more. The era depicted in Italy seems from a generation ago, or perhaps from today in some areas of southern Italy. We learn in a Note To Reader at the end of the book that the story of Tino is true, and is about the childhood of a grown man (the author's father). The Note is accompanied by a lovely map featuring the sort of landmarks a child would note. Italian phrases and words are integrated into the book's text, presenting a child with the concept of another country having another language. The language is easy to understand, with translations incorporated into the text. This book is ideal for starting a child off learning Italian, or for continuing a child's study of Italian as a second language. A Glossary of Italian Terms used in the book is provided at the back of the book. The full-page watercolor illustrations, by illustrator Britta Nicholson, are rich with authentic details characteristic of the Italian countryside, and of the basic houses and their contents. The plants mentioned are correctly depicted, and correct for each time of year. The art style is naïve, simple and clear, colorful and endearing. Children can be prompted to spot different details in the illustrations, with each subsequent reading of the story: the views from the open windows and doors, the cured meats drying overhead, basic cooking ingredients like flour (farina) and olive oil (olio d'oliva), the time on a clock. The text, together with the illustrations in Tino and the Pomodori, which I received as a review-copy, teaches children about the full growth cycle and the necessary care of tomato plants. 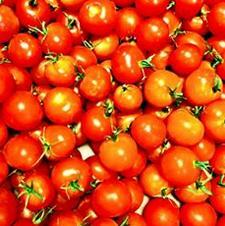 There is even a description of how the seeds are harvested from the tomatoes for the following year. Today's urban children are too often disconnected from the sources of their food. Tino and the Pomodori goes a long way to correcting that lack of education. The text and illustrations in Tino and the Pomodori complement each other perfectly. The basic, practical Italian words are effortlessly integrated into the story. Tino and the Pomodori is the perfect book to broaden a child's education, and to start a child off on learning the Italian language. It is 56 pages long, and available in hardback, to better withstand the multiple readings. 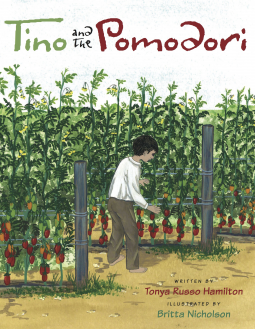 Tino and the Pomodori explores, through the eyes of a child, the magic that is the life cycle of a tomato plant. Tino takes the reader on a journey starting in the piazza of his small village in Italy, to his farm where he learns to work the land. He explains how the tomato starts as a seed drying in the sun and grows to be, la bella frutta - the beautiful fruit, that would eventually make the family’s sauce and bruschetta to go with Nonna’s thick, hard-crusted bread. Visually engaging with vibrant watercolor illustrations, Tino and the Pomodori celebrates simplicity and the beauty of growing, harvesting, and preparing one's own food. Tino and the Pomodori is published by Gemelli Press LLC. Gemelli Press is a boutique publisher based in Seattle, Washington and Calabria, Italy, combining twin passions for books and Italy. Just like an Italian nonna choosing the perfect pomodoro, we too hand select our authors so that we can produce high quality books that touch and inspire our readers. Our unique collection of Italian-inspired publications includes fiction, memoirs, travelogues, and other nonfiction focused primarily on food, wine, and Italian life and culture. At this time, we are not interested in publishing books entirely in the Italian language or English translations of Italian books. Here is a two-minute video tour of an Italian tomato garden, giving a bit of history and culture. Here, in very clear and simple Italian, is an Italian cook showing how Italian tomato sauce is made. And here is an instructional video on how to make the appetizer Bruschetta, like the ones in the book. It is in Italian, but you don't need to understand the language to understand how to make Bruschetta, because all the steps are demonstrated. this is interesting and a little confusing, but what do i know? Great review. Oh, I'm a little confuse about the concept behind the book, not the review.